Back in March, Mary Maxim sent me two types of lovely yarn to try. The first type of yarn I shared with you was the Mary Maxim Ultra Mellowspun DK yarn and you can read more about it in my full review here: Crochet Yarn Talk – Mary Maxim Ultra Mellowspun DK I designed a free crochet pattern you can use with this yarn and the free pattern is linked in the review post. The second type of yarn I received was Simply Casual Yarn. Simply Casual Yarn, is a Super Bulky  yarn. It is super soft and beautiful to work with. The yarn is a 50/50 mixture of cotton and acrylic fibers. I created a short video to show you how the yarn more clearly and a free pattern for you to try with this yarn. Simply Casual Yarn is currently available in 6 pretty shades: Cream, Fieldstone, Wild Rose, Sage, Stonewash and Straw. Care Instructions: Machine wash cool temp. 2 min. delicate cycle. Tumble dry 5 min. delicate. Lay flat to finish drying. I began designing a pretty pattern with this yarn back in April and in order to finish it the way I wanted, I decided to order 2 more balls of the yarn. I totally love the softness and feel of the Simply Casual yarn and I’d love to use it for other projects too. I full soft blanket would be gorgeous and I am also thinking it will make excellent chemo caps – being perfectly soft and breathable. The softness of this yarn makes this small shawl a perfect summertime accessory. 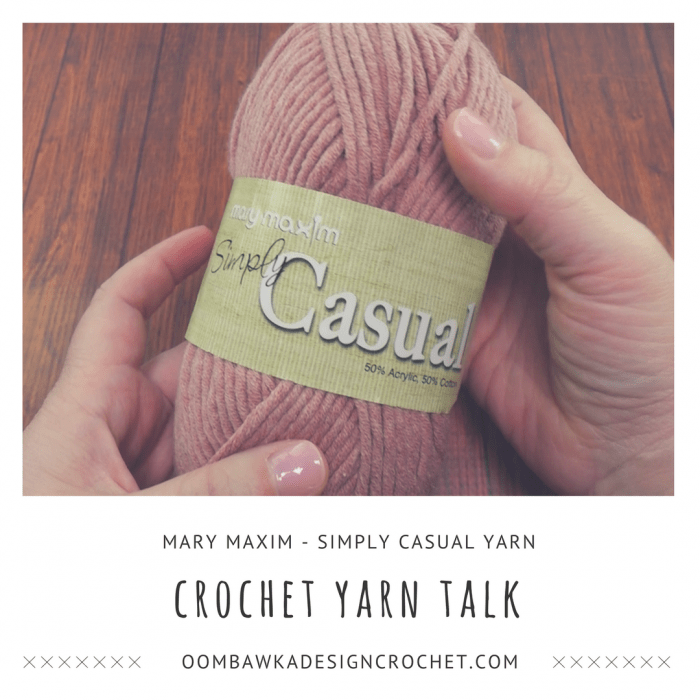 With it’s easy care instructions and the reasonable price point for this cotton/acrylic blend, I definitely recommend Mary Maxim’s Simply Casual Yarn. 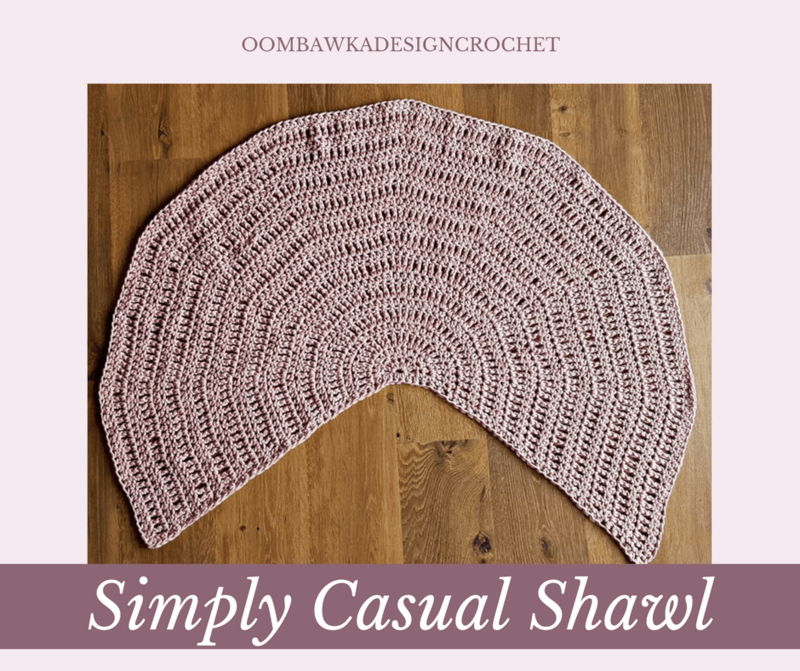 It took 4 balls of yarn to crochet the Simply Casual Small Shawl. The finished shawl has a nice weight and is soft and breathable. You can wear this shawl everyday – it is comforting to wear and casually pretty. I would like to thank Mary Maxim for sending me these free samples of their Simply Casual Yarn and introducing me to a new yarn I really love! For more information about Mary Maxim please visit their Website, Pinterest, YouTube or Facebook. Waiting to try this yarn!